Comments: Good condition with normal wear. Supplemental materials such as CDs or access codes may NOT be included regardless of title. May have bookstore stickers on cover. Expedited shipping available (2-4 day delivery)! Contact us with any questions! 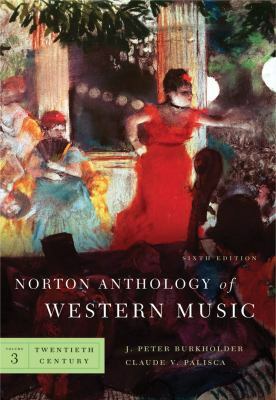 Palisca, Claude is the author of 'Norton Anthology of Western Music, Sixth Edition, Volume 3', published 2009 under ISBN 9780393932409 and ISBN 0393932400. Loading marketplace prices 39 copies from $4.55 How does the rental process work?